DNG Maxwell Heaslip & Leonard is already reporting high levels of interest in its July auctions following the first weekend of open viewings. The various properties scattered throughout the city and county kept the auction team busy with potential buyers eager for a first glimpse of the properties, which will be auctioned on Friday July 24 in the Radisson Blu Hotel just before the city launches into Race Week. With an excellent track record so far this year at auction, the auction team are hoping to better their 95 per cent success rate in an auction which features myriad lots including owner occupier and investment residential properties, development land, and commercial units in Galway, Clare, Roscommon, and Sligo. This exceptional detached bungalow is located in Forramoyle East close to Barna village. The house, on an elevated secluded site of c0.55 acre with wonderful views over Galway Bay, comprises more than 120sq m of living space and is in pristine condition. This bright and spacious home has many features and is being sold with the benefit of an adjoining garage, raised gardens and patio, and its own private driveway. The house is just a five minute walk to Barna village. Solicitor with carriage of sale is Yelverton & Co sols, 2/3 Hartstonge Place, Upper Hartstonge Street, Limerick, phone 061 444445. The AMV is €320,000 and open viewings will take place on Wednesdays and Saturdays from 4.30pm to 5.30pm. This is an exceptionally well located three bedroom duplex townhouse apartment of c970sq ft in a modern, secluded, development. Close to Eyre Square, this property is in top class condition and is ready for immediate occupation. Ideal for the owner occupier, the townhouse also offers the potential of an excellent rental yield. No 40 comes with a private west facing balcony and much sought after residents' parking. Solicitor is Padhraic Harris, Padhraic Harris & Co solicitors, Merchants Gate, Merchants Road, Galway, phone 091 562062. The AMV is €230,000 and open viewings are on Wednesdays and Saturdays from 1pm to 2pm. 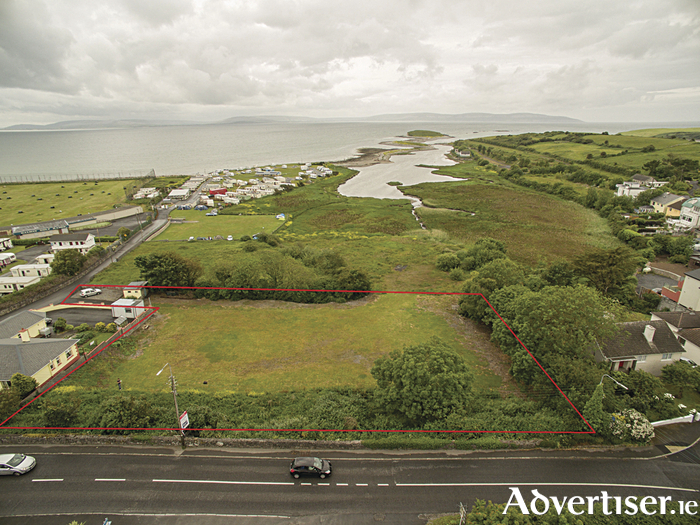 This magnificent one acre development site on the sea shore at Gentian Hill, Knocknacarra, offers uninterrupted views of the Clare hills and Galway Bay. Full planning permission has been granted for three 200sq m homes designed by architects Simon J Kelly & Partners to take full advantage of this vista. Each property faces south with a balcony attached to the master bedroom. The location is unrivalled with a vast range of amenities including Galway Golf Club, Salthill Promenade, schools, and local transport all at your doorstep. The AMV is €450,000 and the solicitor is Diorai Forde, JM Forde & Co solicitors, 2 Montpellier Place, Sea Road, Galway. This large semidetached residence is located in one of Galway city’s most desirable locations, Emerson Avenue in Salthill. Comprising c1,700sq ft of living space, this two storey property is located in a cul-de-sac and has a large corner site. In need of substantial upgrading, the property has huge potential and offers the opportunity for buyers to finish the house to their own taste. There is off street parking and a generously sized northwest facing rear garden. Close to every amenity, the main Salthill thoroughfare is just a short stroll away. Solicitor is Paschal Mullery, Mullery & Co, 33 Woodquay, Galway, phone 091 565136. The AMV is €340,000 and open viewings are on Wednesdays and Saturdays from 4pm to 5pm. This wonderful detached family residence in a much sought after location in Roveagh, Kilcolgan, comprises approximately 2,000sq ft. The property is finished to a high standard but is in need of some decorative works. On a beautiful corner site of almost 0.85 acre, the property has a detached garage, a tarmac drive, and a raised rear deck area. This home is within a 20 minute drive of Galway city and close to both Clarinbridge and Kilcolgan, with access to all amenities. The AMV is €265,000 and open viewings are on Wednesdays and Saturdays from 11am to 12 noon. Solicitor is Paul Halley, William Fry solicitors, Fitzwilton House, Wilton Place, Dublin 2, phone 01 6395000. This is a splendidly located property in the picturesque coastal village of Claddaghduff. The area is renowned for its numerous white sandy beaches, and this property offers uninterrupted views over Omey Strand. The house, at 112sq m, is bright and spacious with an open plan living area. The large picture windows maximise the stunning views over the surrounds and the Atlantic Ocean. Approximately seven miles northwest of Clifden and 3km from Cleggan, the area has a host of amazing beaches and attractions. The village has a shop/pub, school, and church all within a short walk. Solicitor is Janet Tarrant, O'Grady solicitors, 4th Floor, 8-34 Percy Place, Ballsbridge, Dublin 4, phone 01 6613960. The AMV is €180,000 and open viewings are on Saturdays from 11am to 12 noon. This is a top floor duplex penthouse apartment in the much sought after Gleann Na Ri development on the east side of Galway city. Part of a modern purpose built estate, this fully managed complex is currently part of a pooled scheme and offers excellent rental yield. Finished to an exceptional standard, this spacious 900sq ft unit is in turnkey condition. No 121 is being sold with all appliances and furniture. Solicitor is Cathal O'Dea, Coghlan Kelly solicitors, Trinity Chambers, South Street, New Ross, Co Wexford, phone 051 429100. The AMV is €75,000 and open viewings are on Saturdays from 3.30pm to 4.30pm. Situated in Connemara and just a one hour drive from Galway city, this property overlooks Roundstone Bay and the Twelve Bens mountain range and fronts on to Roundstone's main street. It is one of the very few remaining development sites in the town and offers tremendous potential for residential or possible commercial usage, subject to planning permission. The residence is a substantial two storey detached property of c1,416sq ft which is in need of total renovation and stands on a magnificent 0.5 acre site with 26m street frontage. Everything Connemara and this beautiful village has to offer is nearby. The AMV is €270,000 and open viewings are on Saturdays from 1pm to 2pm. Solicitor is Kevin O'Brien, Bowler Geraghty & Co solicitors, 2 Ormond Quay Lower, Dublin 1, phone (01 ) 872 8233. This is a four bedroom detached residence in a quiet, secluded, development in the ever popular location of Spiddal village. On a corner site overlooking a green area, this spacious home is in need of substantial refurbishment, but has plenty of potential for those seeking a family home close to all Spiddal has to offer. Comprising approximately 1,250sq ft of living space, this property has off street parking, a partially converted attic, and a private rear garden. It is within 15 minutes of Galway city. The AMV is €90,000 and open viewings take place on Wednesdays and Saturdays from 3pm to 4pm. This wonderful detached residence in the townland of Ballinahown comprises approximately 3,000sq ft of living space and is on a site of almost 0.7 acre with extensive mature gardens. Finished to an exceptional standard, the house comes with solid wood floors, extensive tiling, a neutral colour scheme throughout, and bright and spacious living accommodation. It is within 3km of Furbo village and just 15 minutes from Galway city, a must-see for all those seeking a top-class family home in a delightful setting. Solicitor is Jack Fitzgerald. Kennedy Fitzgerald solicitors, Bridge Street, Galway, phone 091 562060. The AMV is €320,000 and open viewings are on Wednesdays and Saturdays from 11am to 12 noon. This magnificent cut stone property is located in the centre of one of the most picturesque villages in the west. This end of terrace home is in need of some modernisation and affords a wonderful opportunity to remodel in a traditional style. The 1,050sq ft of accommodation over two floors includes an open plan ground floor kitchen/diner, a living room with feature cut stone fireplace and surround, and three/four bedrooms. The gardens, which could accommodate an extension, have street frontage and overlook Roundstone Bay. All the beauty that Roundstone offers is on your doorstep awaiting your arrival. The AMV is €175,000 and open viewings take place Saturdays from 1pm to 2pm. This is a large detached two storey residence with outbuildings on a site comprising approximately 0.35 acre. Built in the 1960s and in need of major renovations, the house has almost 185sq m of living space with massive room for developing and expanding. Within a short walk of the village centre and all amenities, this wonderfully located property offers an easy commute to Galway city and is sure to attract those seeking a spacious home in a much sought after location. Solicitor is Jamie Fitzmaurice, Mason Hayes & Curran solicitors, South Bank House, Barrow Street, Dublin 4, phone 01 6145000. The AMV is €200,000 and open viewings are on Wednesdays and Saturdays from 2.30pm to 3.30pm. They do not get much more central than this two bed terraced house in St Brendan’s Avenue, Woodquay. Located just off Eyre Street, close to NUIG, UHG, and all the city centre has to offer, this property is sure to attract the astute investor. It does need some modernisation but given its location, you are guaranteed a strong year-round rental income. This sale of this property includes the current tenancy, and with the current tenants in situ a gross yield of 7.8 per cent is on offer. The house comprises a large sitting room, kitchen, and bathroom on the ground level with two double bedrooms, both with fitted wardrobes, in the first floor. Solicitor is Michael J Bradbury, Michael J Bradbury & Co solicitors, Unit 12 Glenrock Business Park, Bothar na Mine, Tuam Road, Galway, phone 091 768030. The AMV is €115,000 and open viewings are on Wednesdays and Saturdays from 2.30pm to 3.30pm. This former pub previously operated as Tir na nOg, and as Dave's Place prior to that. The property is located on Dublin Road in Tuam town centre. This property, while ideally located, is in need of modernisation, and it is sure to attract huge interest given its price and its opportunity. The property comprises a ground floor public house with ladies' and gents' toilets and a basement for storage. The overhead residential unit includes accommodation over two and a half levels, with large windows, but is in need of complete renovation. Solicitor is Joanne Bailey, AC Forde & Co solicitors, 14 Lansdowne Road, Dublin 4, phone 01 6608955. The AMV is €75,000 and viewings are by appointment. This portfolio of four properties comprises three adjoining townhouses and a detached two bedroom bungalow which form part of an infill development. Part of a terrace of six units, Nos 13, 14, and 15 are three storey with open plan living/kitchen area, utility, three bedrooms (one en suite ), and a main bathroom. Number 9 is a two bedroom detached bungalow with own door access. Each property looks on to a secure courtyard with a small yard area to the rear. The development is built approximately 12 years and is in good condition. The AMV is €480,000. This ground floor retail unit of c400sq ft is located in the centre of the seaside village of Liscannor, directly across from Vaughan’s Anchor Inn. Previously used as a retail gift shop and beauty salon, it is ideal for many different business uses in this busy tourist village. The AMV is €20,000 and viewings can be arranged by contacting DNG O'Sullivan Hurley at (065 ) 6840200. Solicitor is Paul O'Brien, McMahon O’Brien Tynan solicitors, Mount Kennett House, Henry Street, Limerick. This is an excellent investment opportunity to acquire a crèche and adjoining residence in the village of Ardrahan, Co Galway. Just off the N18 Galway-Limerick road, this property is 25km from Galway city and is superbly positioned to service the local population who commute to Galway, Shannon, and neighbouring centres of employment. Built approximately 10 years, the entire property standing on c0.63 acre is for sale in one lot. Viewings are by appointment and the AMV is €200,000. The solicitor with carriage of sale is Sinead Sheerin, Lavelle solicitors, St James' House, Adelaide Road, Dublin 2, phone 01 6445800. Located a short stroll from the picturesque village of Cong, this is a modern semidetached home built to a very high standard. Cong is famous as the location for the film The Quiet Man, and is also home to Ashford Castle, and is an excellent starting point from which to explore Connemara, Mayo, and the Wild Atlantic way. Perfect as a family home or investment, this property which is one of only two needs to be seen to be appreciated. The property is fully walled in, and is landscaped front and rear. Private viewing can be arranged by appointment. The AMV is €130,000 and the solicitor with carriage of sale is Sinead Sheerin, Lavelle solicitors, St James' House, Adelaide Road, Dublin 2, phone 01 6445800. Open viewings are on Thursdays from 4pm to 5pm. The auctions take place on Friday July 24 in the Radisson Blu Hotel, Lough Atalia. Full details are available on dnggalway.ie or by contacting DNG Maxwell Heaslip & Leonard on 091 565261.